Ddee was born in Southampton 1959, later in life as a mature student took a Foundation in Art and Design at Southampton City College , after which she went on th Solent University to study Fine Art. Ddee gained an Honours Degree in Fine Art 2/1 First Division.The University purchased five of her abstract paintings,you can find images of these paintings on Artuk.org website, also has been published in The Public Catalogue Foundation - Oil Paintings in Public Ownership Hampshire and Isle of Wight, however it will be under the name of Dee Young as Dee’s name has now changed to Ddee King. 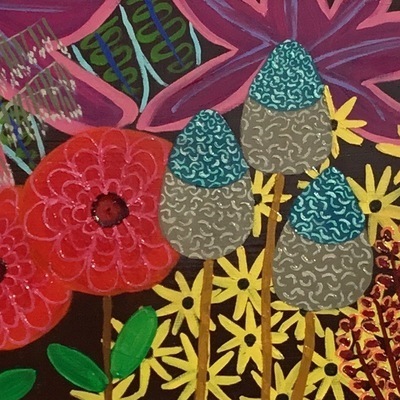 Since graduating in 2001 Ddee has continued to paint and her paintings have been collected by government and corporate bodies such as the N.H.S. National Solvency Office London, Hampshire Council, Philips Semiconductors, Gordon and Teague and others. Runner up of the Phillips Art competition, runner up at Lauderdale House Art competition in Highgate London. Ddee has entered open competitions and has had work shown in Southampton City Art Gallery, The Millais Gallery and other galleries including Quay Arts Newport Isle of Wight. Ddee has sold many paintings to collectors around the world and U.K. 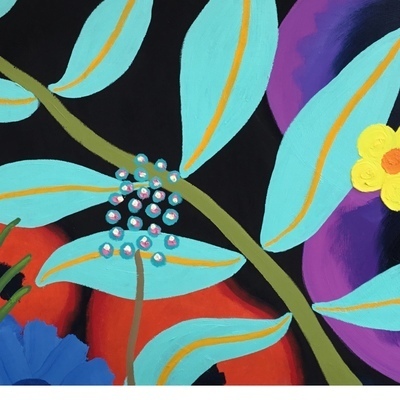 Being inspired by nature, Ddee is now living on the Isle of Wight, painting amazing colourful botanical images after being enthralled from a visit to Hampton Court Palace R.H.S. Flower Show and The Botanical Gardens of Ventnor.